Five individuals and one organization have received 2018 Alberta Community Justice Awards in recognition of their work to make their communities safer. 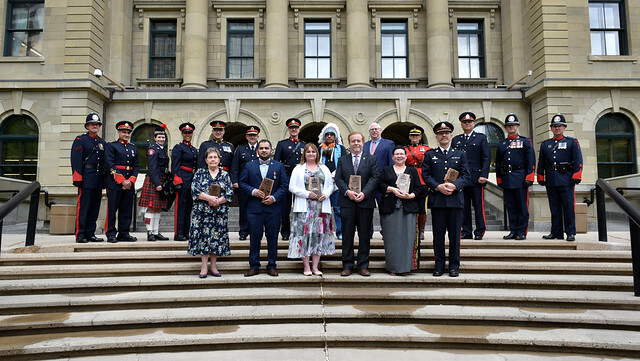 2018 Alberta Community Justice Award recipients with Deputy Minister Bryden, Maskwacis elder Kirk Buffalo, and honour guard members from the Calgary Police Service and RCMP. The 27th annual Alberta Community Justice Awards honour outstanding Albertans who have found innovative and proactive ways to prevent crime in their cities and neighbourhoods. This year’s awards ceremony was hosted by the Government of Alberta and the Calgary Police Service and took place on June 1 at McDougall Centre. The awards are presented in five categories: leadership, innovation, service enhancement, community mobilization, and partnerships and collaboration. A coalition of neighbourhoods and residents seeking to build safer communities through information campaigns, anti-graffiti efforts and anti-bullying events. The president and one of the founding members of Vermilion Citizens on Patrol, and a liaison between her community and local law enforcement bodies. The founder of Do Not Be a Bystander campaign, which seeks to raise awareness of street violence and teach anti-bullying techniques. A criminal court worker and the developer of several programs designed to provide culturally sensitive court assistance, life-skills training and drug and alcohol awareness to at-risk youth. An auxiliary constable with the St. Albert RCMP whose work volunteering with the Crime Free Multi-Housing program has helped building owners take steps to prevent property crime. The superintendent of the Edmonton Police Service’s Coordinated Policing Division, and an instrumental part of the Heavy Users of Service Project, which coordinates the efforts of health and social service providers, first responders, justice services and many other organizations to serve vulnerable individuals with complex needs.